One of the more fascinating dinner shows in Las Vegas for families to watch and engage in the action is the Tournament of Kings. Guests will be delighted with the jousting, sword play, fireworks as well as the dinner menu as they watch while cheering on their favorite king and their knights. As you enter the arena a pungent smell takes you back to medieval days of knights, kings, horses and battles for land as well as tribute. When you reach your seat, you will be greeted with a three-course meal to devour before the action starts. Your pleasant meal begins with a dragon blood soup (tomato soup) that will transport you back to the days of King Arthur. The second course, which you eat with your hands, is a nicely roasted Cornish game hen or chicken accompanied by side dishes. Dessert is a scrumptious piece of apple strudel for all to enjoy. While you are indulging in your medieval feast, a round table with dancing girls is lowered from the ceiling where the knights, queens and kings will enjoy their feast along with you. After eating the crowd gets revved up for the performance which is a magnificent display of energy, sportsmanship and courage. As the knights take to the arena, there is table pounding and cheering for your favorite knight as he swords fights with another knight. The sword fighting is highlighted by sparks from the titanium swords hitting each other as the knights’ duel for their kingdom. When the horses enter the arena, the knights are perfect with their jousting sticks which protrude in front of the horses and pierce their opponent’s chest. The showmanship is marvelous as the knights’ gallop around the arena waiting for their next fighting challenge. The evening comes to a close with an energetic exhibition of fireworks that will have your ears ringing for days. In the end the Tournament of Kings is a wonderfully choreographed show of courage with spot on medieval costumes, horses with beautiful saddles and a crowd that is just waiting for more blood as well as excitement from the jousting matches. The Tournament of Kings is played out in the 900 seat theater-in-the-round style auditorium at Excalibur Hotel and Casino named King Arthur’s Arena. 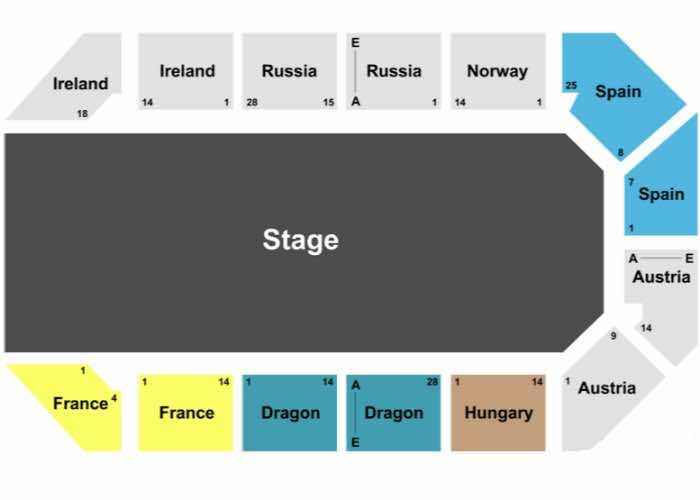 Sections are named after countries such as Ireland, Norway, Spain, Russia, Hungary, Austria, Dragon and France. Guests can choose which country they wish to cheer on when buying tickets. Seats closer to the 270 degree arena are the best for viewing but every seat has good sight lines and a table to pound when the action gets heated. The Cast of Tournament of Kings consists of 10 horses and 36 members acting as knights, kings, queens as well as servants. The production team of the show has been in place since the show opened in 1999. The Tournament of Kings is performing within the King Arthur’s Arena at Excalibur Hotel and Casino. The 75-minute show runs Wednesday through Monday beginning at 6:00 P.M. with additional shows at 8:30 P.M. except Monday and Friday. There are no age restrictions for this show. Tickets for the 6:00 P.M. show include a three-course meal. General admission tickets are available with or without the meal for the 8:30 P.M. show time only. VIP tickets include early admission, preferred seating in the center, commemorative photo and a souvenir.